With only Hustle Kings to really compete with, Pool Nation enters the digital pool hall looking to wipe the floor with the posers. No cutscenes, no irritating voice-overs, just pool. We like it already. You can dive straight into the lengthy tournament campaigns without bothering with the tutorials if you just want to get stuck in. Basic shots are a breeze. Some very handy aiming lines are turned on by default showing the path of the white ball and a separate path for the ball you’ll hit, making even the sharpest angled shots effortlessly simple. Aim with the left stick and you can nudge it more precisely in aim mode by tapping L1. Pull back on the right stick to fill a power gauge and press forwards to strike the cue ball. The power can even be locked in with a tap of R1, allowing you to make better judgments using the guideline as it may change when power is factored in. It wasn’t long before I fancied trying out a few trick shots and using spin on the ball. Thankfully, the bite-sized tutorials do a great job of explaining how to do jump shots and add swerve to get around any obstacles. I’ve played many pool games in recent years, but this is by far the best use of trick shots I’ve seen. I can safely delete Hustle Kings forever now. Flashier shots can take quite a while to line up as you try and wrestle spin and cue angle settings to convince the guideline to get the shot lined up for whatever madness you have in mind. This is fine when playing on your own, but can be very irritating in multiplayer matches. A standard view is available, but I found that I rarely left the excellent overhead one as it displays the best angles to plot your pots. Slow motion replays kick in on very rare occasions and show off the extremely shiny nature of the balls, stop laughing, we all know I had to say something about them eventually. I’ve no idea what the criteria is for these slick replays to kick in is, as I sunk loads of beautiful jump and spin shots without one, but got a few for simple close range shots. It’s like nailing an awesome shot in real life only to look up and realise nobody saw it. Oh well, you can always pause this and manually ask for a replay. It’s not the same though. There are two campaigns to play through, with lots of matches in each. Eight ball pool is the one where I spent most of my time, as it’s similar to pool you’d play in any UK pub. It’s spots vs stripes rather than red vs yellow, which is quite annoying actually as it’s often difficult to discern between the two at distance and there’s no way to zoom in for a closer look. Different ball sets can be unlocked, but they’re variations on spots and stripes. Most matches are the familiar setup of sinking seven balls of one type before potting the black. There are three stars to be earned for each match though. The goals for these stop matches becoming too monotonous. Pot five in a row, get a bank shot pot, perform a jump shot and so on are things to try to tick off on your way to victory. Bonus matches change up the rules. One asks you to pot everything as quick as possible and beat your opponent’s time. Golf involves having to hit a ball into a certain pocket no matter how many attempts it takes. Killer involves a number of ‘lives’ with players losing one if they fail to pot on their turn. These and additional modes provide a nice respite from regular matches. That’s pretty much it for the career mode, you face many different opponents, but you only ever see them as a picture at the start of the round. When they’re taking a shot you can skip each one if you don’t want to watch it in full, which is great for getting the game back to your turn. That’s if you get a turn though. From the start, the AI is devastatingly tough; watching them rack up six shots in a row is not a rare sight. Sometimes you’ll only miss one shot then just sit back as they seven ball you. There’s just no difficulty curve, making it feel like you’re facing yourself in every match as mistakes are punished without mercy. Thankfully, there’s a flashback system in place similar to those you’ll find in the Dirt rally games. Press Select after a poor shot and you can use one of your two flashbacks to take the shot again. This is particularly useful while getting used to trick shots and it encourages much more creativity. The other tournament uses nine-ball pool throughout instead of the familiar eight-ball setup. I found this to be utterly pointless though as players must clear the same set of balls with the winner being the one to pot the last one. Essentially, the AI can sit back until you miss the last ball then swoop in for an easy win. It feels like a waste of time compared to eight ball matches, but at least it’s not forced upon you. A separate endurance mode has a sound concept, but the execution is lacking. 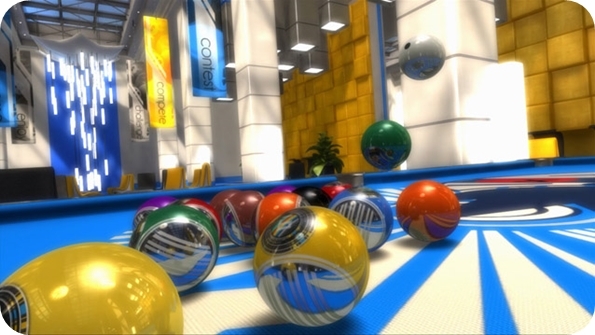 You must pot balls as soon as possible as extra ones are repeatedly dropped onto the table. Once there are 24 on there, it’s game over. You can’t move your cue around the table while the cue ball is still moving after a pot, and the default position is rarely pointing towards where you want to shoot next. Valuable time is also eaten up by the extremely slow precision aim mode. Regular aiming is too lose on its own, there’s a middle ground setting missing to allow smoother action. It’s not a problem in matches without time restrictions, but here you really feel it. Online and local multiplayer options are available, which can be great fun, but just like real pool, playing against someone that’s taking forever to line up a shot can be incredibly irritating. You’ll want to ditch the guidelines to give matches are more natural feel or they’ll consist of only a couple of turns for each player at the most. Speed pool matches should take care of any slow players too. Why don’t the slo-mo money shots kick in more? The Short Version: A must buy for pool fans at a very reasonable £4.99. The AI is ridiculously tough from the start, but if you play your own game there’s lots of pool table action to be had. The user-friendly trick shot implementation raises Pool Nation high above the competition. Keep your fingers crossed for a Vita version soon too. Big thanks for an accurate piece of game information.